The first intimation of trouble comes in the form of an invitation to sit next to the dean on the steps outside his office, instead of on the nice comfy couch inside his office. Who are these anonymous “complaints” coming from? What is their sinister agenda? My attempts to defend myself and my teaching style fall on deaf ears. Fortunately, qualified professors of magical studies are in short supply, so instead of losing my job, I am offered a transfer to another department. 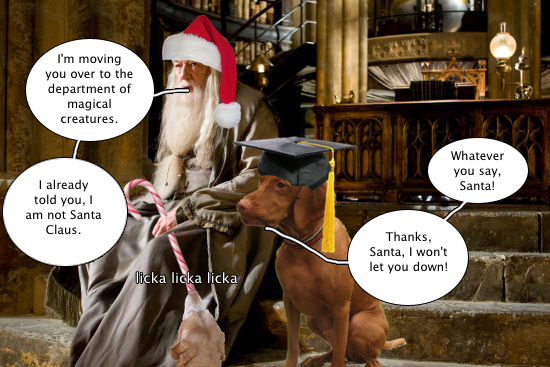 The complainers may have won this round, but I will get the last bark — I will be the best magical creatures professor there ever was! I am beginning to think that the school’s star pupil has it in for me. Could she be the one who caused me to lose my position teach potions? 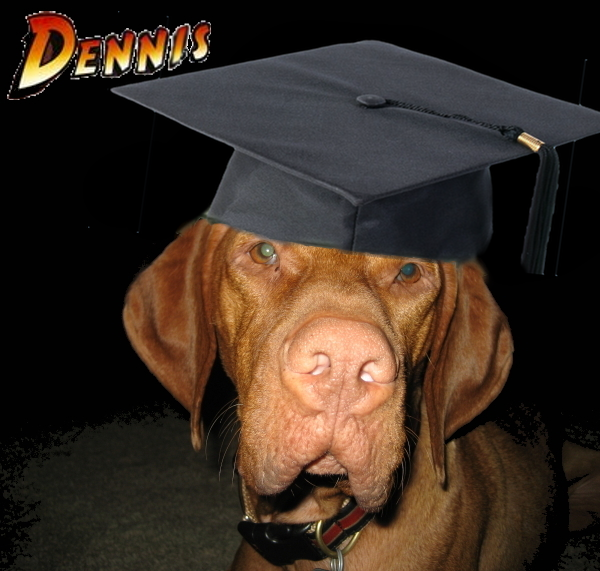 I will begin to make discreet inquiries until I find out the truth … because I am Dennis the Vizsla, and I never give up. Don’t ask too many questions, Dennis! We scents trouble around the dark corners! 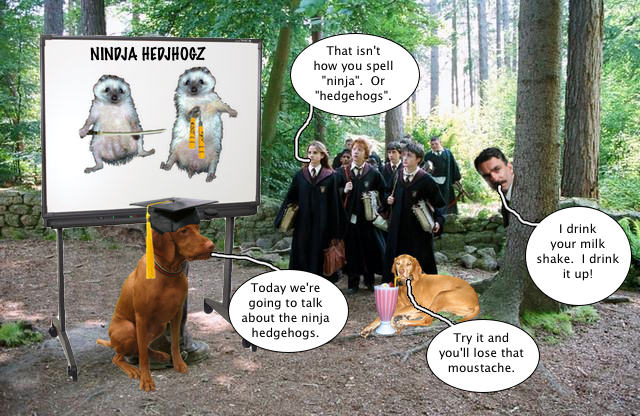 We think you should feed Hermione to the Ninja Hedgehogs. 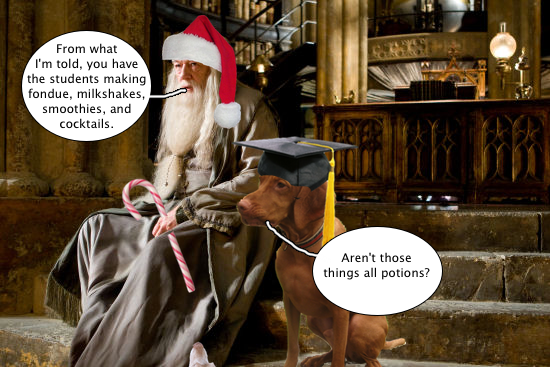 Just saying… And we like your idea of potions – not to mention that you’re MUCH BETTER LOOKING than the other potions instructor at that place. This isn’t looking good for you, Dennis. But Tucker is doing great, lots of goodies for his tummy. Will Spiney Norman make a guest lekhture appearance? Watch out for that Malfoy brat! Hmm, we sense trouble Dennis. Better watch your step. 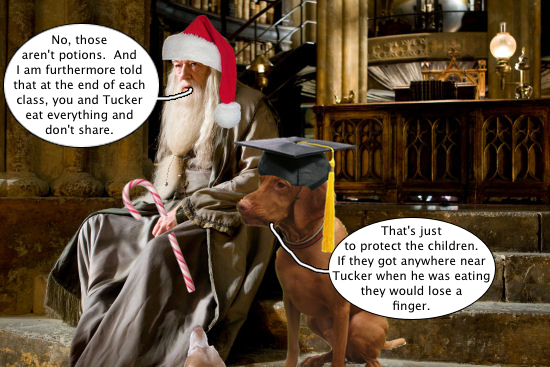 Did Tucker drink one of your Shrinking Potions? He seems smaller, not only compared to you, but compared to the milk shake. We fail to see how ninja hedgehogs are going to contribute to feeding your and Tucker’s insatiable appetites. So what magical creatures can you employ that provide or can secure food? And that won’t contribute to your getting the sack? You’re cycling through the Master’s positions pretty quickly, dude. We’re waiting to see what you will do with Defense Against the Dark Arts. Which brings us full circle back to the ninja hedgehogs. Don’t assume Hermione is your enemy. Remember it was ALWAYS Draco who was complaining to his Death Eater dad, trying to get good Masters fired. And you are on the Light Side [in so many ways], not the Dark Side, aren’t you? We’ve got our magic bully sticks, ready to help bail you out when [not if] you get in too deep. It’s your fav reeder Norweed. Huh you teach magikal creatures? I wonder if that includes my cousin tula.. she is a monstah! I bet that do gooder girl is out to get you. She probably likes red heads. hey dennis, don’t listen to norweed. he’s nutty. i say give miss goodie toola shoes a spekial project.. like get the milkshake from tucker! I have noticed that the Christmas ham often causes a lapse in judgement! 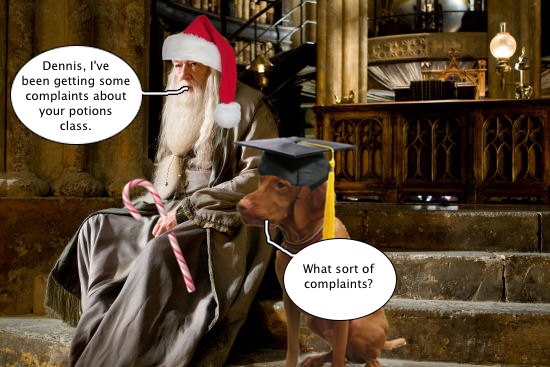 I’m surprised I’ve never noticed the resemblance between Dumbeldore and Father Christmas before! Coincidence? I think not!